In response to designer demand for an artisan quality green roof paver which integrates with LiveRoof®, and contractor necessity for labor-saving solutions, LiveRoof developed the RoofStone® paver system. RoofStone pavers are designed to integrate seamless with the LiveRoof Standard and Deep system options. Finish: Beautiful artisan surface, top edge chamfered, sides with chip preventing water-conducting standoffs. Edging: Only required if paver abuts open space. LEED Interface: Base of 100% post-industrial polypropylene. Concrete recycled content varies with color of paver. Integrates with weight, height and dimensions of LiveRoof® Standard & Deep modules. Built-in handgrips and pedestals for fast, efficient installation. 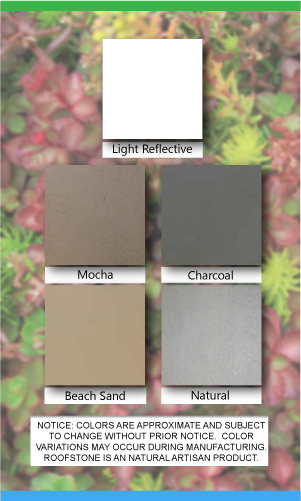 No edging needed between RoofStone® paver and LiveRoof®. Perfect for pathways / landings and patios. Strong & effective, resists impact and cracking with NanoTech MicroBubble™ technology. Download the Product Warranty, Specifications, Brochure, or Installation Instructions.